These carvings at Avalakki Pare, about 15 km from Kollur, were discovered on February 17 by a team headed by Prof T. Murugeshi. 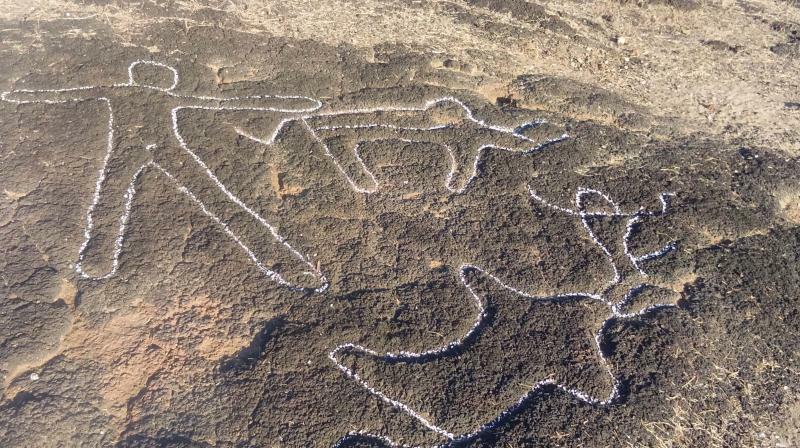 The rock carvings at Avalakki Pare village near Kollur. Udupi: A petroglyph site with over 19 unique rock art dating back to about 10,000 BC has been discovered near Kollur in Udupi district. These carvings at Avalakki Pare, about 15 km from Kollur, were discovered on February 17 by a team headed by Prof T. Murugeshi of the History and Archaeology Department, MSRS College- Shirva. A detailed study is being conducted by the team. As per preliminary studies, the rock art is about 12,000 years old (around 10,000 BC) and carved by people of the Mesolithic age who basically were involved in hunting. The carvings include images of human beings, bison and other animals. An image clearly shows a person hunting an animal indicating that the carving was by those belonging to the hunter gatherer culture. "This site dating back to the Mesolithic age is the oldest petroglyph site found in the Western Coast. There are other petroglyph sites in the region but of a later age. At present we have found 19 rock art and more are expected to surface when we clear the nearby stones,” Prof Murugeshi told Deccan Chronicle. The team has decided to start the study of the region after April. During the vacations, Prof. Murugeshi plans to bring his students to the site and clear the wild growth, grass and the soil on the rocks and try to find more such images. “This proves Kollur and nearby areas had a population over 12,000 years ago. In later days, more habitats might have developed in the region,” he added.